Mexican rice makes a wonderful side dish for any Mexican-inspired dish. Unfortunately, unless you’re buying the pre-made rice in a box, it’s also notorious for taking a while to prep and cook. What if there was a way to enjoy the delicious taste of Mexican rice without having to slave over your cooktop? Believe it or not, there is; this oven-baked Mexican rice recipe will save you time while still yielding the same delicious results. So here is our easy recipe for how to cook Mexican rice in the oven. Of course, you can also add your own spices and ingredients—such as cumin or even diced peppers—to customize this dish as desired. That’s the beauty of it! Start by preheating your oven to 350 degrees and rinsing the rice in water, which will help it cook more quickly. Then, in a large bowl, combine all of the ingredients until they’re mixed together well. Next, pour the mixture into a sheet pan and spread it out so that everything lays on the pan as evenly as possible. Finally, cover the pan with aluminum foil and place the entire thing into the oven. Check on it regularly; it should be done within an hour, but you’ll want to avoid overcooking, as the rice can become hard and crunchy if it’s left in the oven for too long. Once the rice is done, carefully remove the foil so as not to burn yourself. Let the rice sit for about five minutes, then use a fork to fluff and mix the rice before serving. It really is as simple as that! The key to successfully cooking Mexican rice in the oven is to make sure you’ve got a tight seal on the pan. Therefore, it’s recommended that you use at least two layers of aluminum foil to cover the pan and that you avoid gaps in the foil that would allow steam to exit the pan. Keeping the steam in the pan is important to ensuring that the rice cooks properly and ends up with the correct texture. If you have a pan that came with an oven-safe lid, this would be an even better option for covering the pan while the rice cooks. 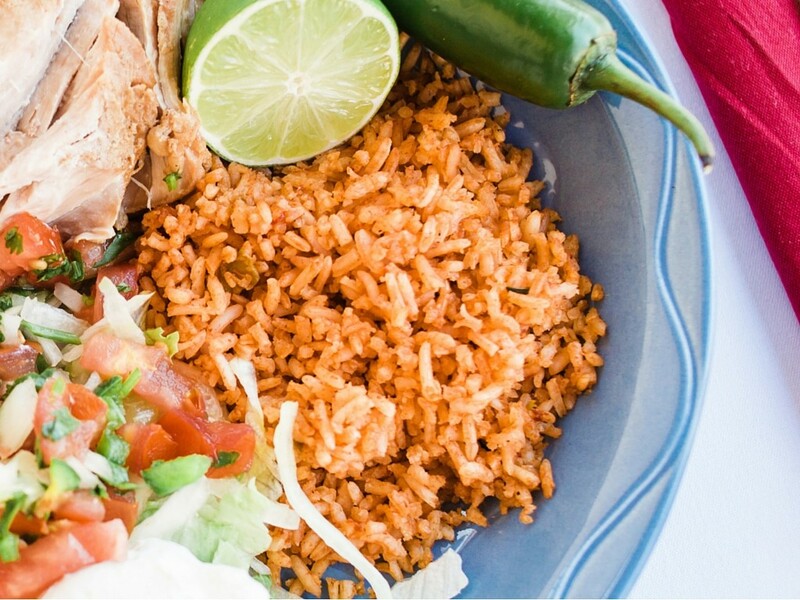 Cooking Mexican rice in the oven can save you a lot of time when compared to cooking it on your stove top, so be sure to give this a try the next time you have a craving for this yummy dish. You’ll probably find yourself wondering why you didn’t think to try cooking rice in the oven before!